Covering an area of less than one square mile, Point Cabrillo Light Station State Historic Park is one of the smallest of the preserves along the north California coast, yet still has plenty of scenic places. Most of the park is a flat, grassy plateau bordering the ocean, crossed by a few tiny streams and dotted with occasional patches of trees, which provide habitat for a herd of blacktail deer. 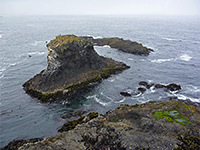 The one mile section of coastline is eroded into several narrow inlets and tiny beaches, while other sections form cliffs, terraces, promontories and sea caves, all lined by numerous offshore rocks, large and small. 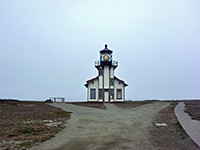 In this respect the park is no different to many other parts of the Mendocino Coast, such as the nearby preserves of Caspar Headlands, Mendocino Headlands, Russian Gulch and MacKerricher, but it has one extra attraction in Cabrillo Light Station, the centerpiece being a handsome lighthouse with white walls and a contrasting red roof. The building was completed in 1909 and is still in operation today, its continued active use being confirmed as recently as October 2014. The light station was added to the state park system in 2002. Other historic structures in the park include a blacksmith's shop, a farmhouse and three lightkeeper residences, two of which are available for rent, as holiday homes. The other three of these buildings are open to visitors each day between 11 am and 4 pm, but perhaps the best activity in the park is just walking along the various trails, following the wave-carved shoreline, while viewing the lighthouse from different angles. Two other occasional attractions are grey whale watching - the animals pass by here in late winter and early spring, and lens tours, which are provided on just a few days of the year. Harbor seals are also often seen. 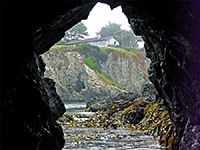 Although close to Highway 1, the state historic park is accessed by a parallel side street (Point Cabrillo Drive), starting a couple of miles south, beside Russian Gulch. The road sees little traffic, and passes through a peaceful residential area. The paved parking lot for the lighthouse is right beside the road, next to a restored farmhouse lined by wind-sculpted cypress trees. Just beyond is a field used for overflow and large vehicle parking. Another road (half mile) leads directly to the lighthouse, but this may be driven only by disabled visitors, guests at the vacation homes, state park staff and the lighthouse keeper; all other people have to walk. An alternative approach is along a parallel path to the north, through long grass prairie and coastal scrub. If visiting all the shoreline, the northern path is the best route to start. A walk along here, then on a linked, less-used path to the right, reaches the main beach in the park (Frolic Cove), a still relatively small stretch of sand and stones, overlooked by houses on the bluffs to the north. The bay is named after the ship Frolic, wrecked here in 1850. Moving southwards along the coast, the next inlet is a rocky cove with sea caves on both sides, and a small island, all viewable via an easy climb down. Beyond here are various terraces and bays, extending south to the lighthouse, which is built just 60 feet from the edge of the bluffs at the closest point, on a peninsula that is gradually being eroded to form a detached plateau; the peninsula is 500 feet across at the widest point, but just 100 feet wide at the inland edge. The coast is similar south of the lighthouse, with several more inlets and little beaches, but no more routes down to the water's edge. The intermediate-level terraces can be explored however, and they are formed of grey-brown greywacke sandstone eroded into a variety of shapes, though not any of the photogenic tafoni textures. 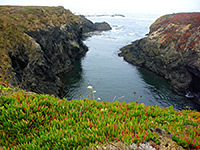 The very edge of the bluffs are home to great colonies of invasive iceplants, mostly carpobrotus chilensis, the sea fig. The southern section of the park seems less visited, and the shoreline path is narrower: another residential area borders the preserve, with more homes constructed right at the edge of the coast.